Applied Kinesiology (AK) is a method of diagnosis using manual muscle testing to determine the state of the body. This technique can determine what stresses cause the body harm, what stresses are currently causing harm, and what is needed to allow the body to quickly achieve better health. Applied Kinesiology, also referred to as “functional neurology”, can actually prioritize what stresses are currently most critical. By testing muscle groups and specific muscles in the body, the structural, chemical and emotional/electromagnetic systems can be evaluated. The doctor diagnoses muscles with neurological weakness and then determines methods that return the muscle to normal strength. The difference between a “weak” and a “strong” muscle is a neurological process; it is not merely an indication that the person needs to workout. By evaluating all of the aspects of health with muscle testing, a true picture of the overall problem emerges. Therefore, Applied Kinesiology helps a range of people from the chronically ill who want to achieve better health to world class athletes striving for optimal performance. 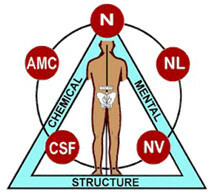 Applied Kinesiology understands the triad of health. This theory states that all problems have structural, chemical, and electromagnetic/emotional components to them. With manual muscle testing, the doctor may evaluate all three aspects of a single problem. When each facet of a problem is addressed correctly, the body can heal at optimal rates. Dr. George Goodheart founded applied Kinesiology in 1964. He noticed a direct correlation between postural distortion and weak muscle patterns. By treating the weak muscle, using different methods, the muscle would return to normal function and posture would improve. From this point AK expanded into the massive technique that it is today. The International College of Applied Kinesiology (ICAK) was founded in 1976. This organization is comprised of hundreds of doctors who learn, study, develop and extend the technique. Today, the ICAK has chapters not only in the USA, but all over the world. Its members include doctors of all disciplines, not just Chiropractors. This is the only true organization of Applied Kinesiologists. Their board of teachers certifies doctors as they become increasingly proficient. Many people in the alternative arts use aspects of muscle testing, calling it Applied Kinesiology. This is unfortunately not AK. AK is more than the ability to test muscles; it is also the ability to evaluate the underlying causes neurologically so the best treatment can be administered. Today Applied Kinesiology exists as a true holistic method to evaluate and prioritize the bodyâ€™s stresses. Studies show a significant difference between doctors who are properly trained and those who are not. There can be significant error in evaluation by unskilled muscle testers. Some even abuse muscle testing for unethical practice (i.e. to sell people items, affect decisions, etc.) If you are interested in getting help from an Applied Kinesiologist as in any specialty, you should go to a certified doctor to ensure proper treatment. Allergies, Anxiety, Asthma, Back Pain, Better Athletic Performance, Chronic Fatigue, Detoxifying the Body, Depression, Disc Problems, Dyslexia/ADD, Headaches, Hormonal Imbalance, Hyperactivity, Injuries, Joint Problems, Leaky Gut, Mal-absorption, Menstrual Problems, Mental Cloudiness, Migraines, Muscle Rehabilitation, Sleep Disorders. Applied Kinesiology is a non-invasive evaluation of the body. It is a true holistic approach to health. Deal with the cause of a problem and the problem usually takes care of itself. When Dr. George Goodheart first discovered Applied Kinesiology (What is AK) his goal was to teach others. However, as Applied Kinesiology spread, many people of various disciplines learned the methods and taught others. Since the term Applied Kinesiology itself was never trademarked nor copyrighted, it paved the way for anyone who knew even a basic muscle test to use the phrase. Unfortunately this allowed people who had no formal training, nor expertise to utilize minimal parts of the technique and yet market themselves as Applied Kinesiologists. After many years of fielding problems from uneducated people stating they used applied Kinesiology, the ICAK (International College of Applied Kinesiology) trademarked the term for Professional Applied Kinesiology. To be considered a Professional Applied Kinesiologist (PAK), a person must be a Doctor licensed to Diagnose. They must also satisfy continuing education credit requirements as well as prove on an ongoing basis that they are the top in their field utilizing specific muscle testing for true proper evaluation of functional imbalance.